Catherine E. Williams, 88, passed away January 29, 2019 at Oakwood Health Campus in Tell City. She was born in Perry County, Indiana on August 29, 1930 to the late Alvia and Myrtle (Goffinet) Howell. Catherine is preceded in death by her husband, Gilbert A. Williams in 2007; a sister, Mary Belle Kempf; and brothers, Edward and James Nathan Howell. Catherine was a 1949 graduate of Tell City High School. She had worked as a CNA before retiring in 1993. 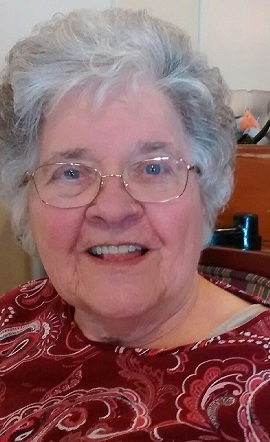 She was a member of Lilly Dale Church of Christ and enjoyed spending time with her family, especially her grandchildren, reading, bird watching and flower gardening. Surviving are her children, Peggy Thomas (Bob), Leopold, Tammy Damin (Phillip), Hilliard, Ohio, Cindy Lewis (Jim), Tell City and Tony Williams (Clara), Tell City; grandchildren, Nikki Lewis, Haley Trimm (Aaron), Robbi, Maggie and Garrett Thomas, Anthony Williams (Tameka), Kenzie Nicolicchia (Andrew) and Hannah Damin; six great-grandchildren, Evelyn Drake, Warren Cash, Niklaus and Elaina Trimm, Braxten and Eastten Williams; a sister, Lois Burton, Derby; brothers, Clyde T. Howell and Jerry Howell, Tell City. Funeral services will be held at 11:00 AM CST Saturday, February 2, 2019 at Huber Funeral Home, Tell City Chapel. Aaron Trimm and Brother Eddie Olberding will officiate. Burial will be in Lilly Dale Cemetery. Visitation will be Friday from 2:00-7:00 PM and Saturday 9:00-11:00 AM at the funeral home. Memorial contributions may be made to Lilly Dale Cemetery.